Our dietary supplement P.E.A. is the result of many years’ research into palmitoylethanolamide. More commonly-known as PEA, this compound’s considerable therapeutic potential has made it the subject of numerous scientific studies. The anti-inflammatory and analgesic properties of this fatty acid amide have been known for decades but it was in 1990 that its therapeutic benefits were properly recognised by the scientific community as a result of the work of Italian Nobel Laureate Rita Levi-Montalcini. This famous neurologist demonstrated PEA’s efficacy in treating some types of neuropathic pain. Further research then led to the development of PEA-based nutritional supplements. These products have been available since 2010 in the form of powder or capsules and have made quite an impact in the Netherlands where they are offered as a new kind of P.E.A..
Our new product, P.E.A., offers all the anti-inflammatory and analgesic properties of palmitoylethanolamide (PEA). The effects of this compound are significant given that pain can be common and varied. It can take the form of acute pain which is temporary in nature, or chronic pain that persists over a long period of time. Scientists also categorise pain by its origin: inflammatory pain which involves the immune system, neuropathic pain which is associated with the nervous system, and a mixture of the two – both inflammatory and neuropathic. A number of treatments have been developed to relieve such pain and it is within this context that PEA has been identified as natural solution to pain that is inflammatory, neuropathic or a mixture of the two. PEA has the advantage of being a natural molecule, found, for example, in eggs and milk. It is PEA’s particular mechanism of action which is responsible for its exceptional properties. According to some scientists, this fatty acid amide works by binding to a specific cell receptor called PPAR-alpha. This receptor activates peroxisomes - cell organelles involved in the regulation of pain and inflammation genes. By binding to the PPAR-alpha receptor, PEA reduces peripheral sensitivity induced by both neural and non-neural cells. In other words, PEA’s action reduces the sensation of pain in a number of situations. In this context, encouraging results have already been obtained in the management of diabetic neuropathy, chemotherapy-induced peripheral neuropathy, carpal tunnel syndrome, back pain, sciatica, pelvic pain and multiple sclerosis. P.E.A. 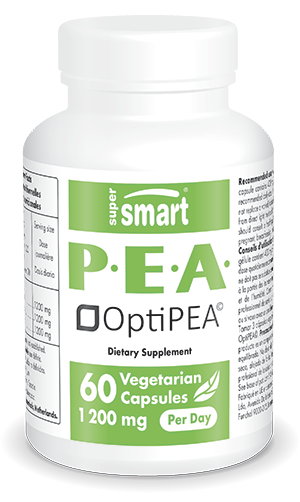 has been developed from a high quality, patented PEA formulation called OptiPEA©. This pain relief supplement is in capsule form with a suggested dose of three capsules a day, although this dosage can be adapted to your needs and the advice of your therapist. It should be noted that taking this supplement may not produce instant pain relief. Several days’ supplementation may be necessary to obtain the desired results. You may also be interested in our other formulations aimed at relieving joint pain: OptiMSM® and Joint Support Formula.mitoylethanolamide. More commonly-known as PEA, this compound’s considerable therapeutic potential has made it the subject of numerous scientific studies. The anti-inflammatory and analgesic properties of this fatty acid amide have been known for decades but it was in 1990 that its therapeutic benefits were properly recognised by the scientific community as a result of the work of Italian Nobel Laureate Rita Levi-Montalcini. This famous neurologist demonstrated PEA’s efficacy in treating some types of neuropathic pain. Further research then led to the development of PEA-based nutritional supplements. These products have been available since 2010 in the form of powder or capsules and have made quite an impact in the Netherlands where they are offered as a new kind of natural pain relief. Our new product, Natural Pain Relief, offers all the anti-inflammatory and analgesic properties of palmitoylethanolamide (PEA). The effects of this compound are significant given that pain can be common and varied. It can take the form of acute pain which is temporary in nature, or chronic pain that persists over a long period of time. Scientists also categorise pain by its origin: inflammatory pain which involves the immune system, neuropathic pain which is associated with the nervous system, and a mixture of the two – both inflammatory and neuropathic. A number of treatments have been developed to relieve such pain and it is within this context that PEA has been identified as natural solution to pain that is inflammatory, neuropathic or a mixture of the two. PEA has the advantage of being a natural molecule, found, for example, in eggs and milk. Natural Pain Relief has been developed from a high quality, patented PEA formulation called OptiPEA©. This pain relief supplement is in capsule form with a suggested dose of three capsules a day, although this dosage can be adapted to your needs and the advice of your therapist. It should be noted that taking this supplement may not produce instant pain relief. Several days’ supplementation may be necessary to obtain the desired results. You may also be interested in our other formulations aimed at relieving joint pain: OptiMSM® and Joint Support Formula. Each capsule contains 400 mg of OptiPEA©.